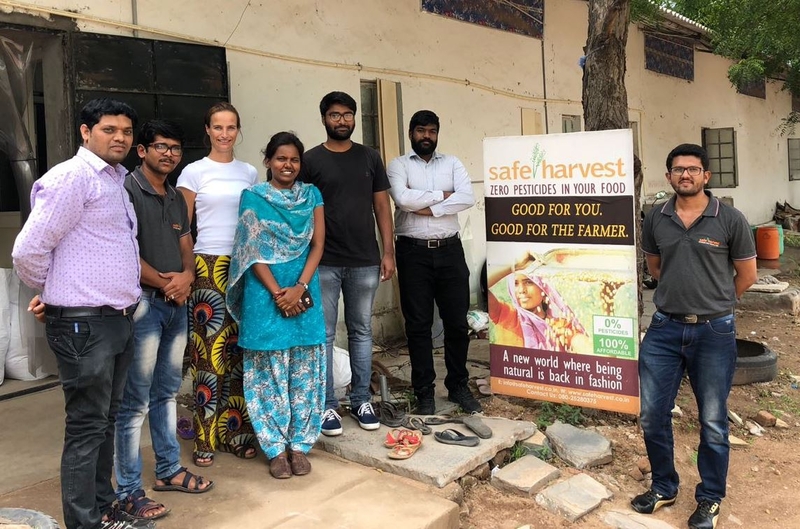 Plan was to meet up with the first social enterprise (Safe Harvest in Hyderabad) on Monday evening, but due to heavy rains in Delhi, our flight was delayed so I first met ‘my’ supply guys on Tuesday morning. After a quick introduction, we did a full tour through the company’s building. My first time in a production facility on bare feet! Apart from only a few small offices, most of the space was filled with materials. Most of the workers were women and the sales were growing. Safe Harvest is already a business partner of Women on Wings for some years, so I felt definitely at the right spot. I enjoyed talking with supply chain officers, hearing their issues, discussing solutions, trying to get into actions. But I really had to get used to the Indian English, so I had to ask a lot before I really understood what was meant. We calculated on the capacity needed for the coming season, advised to align more with Sales, gather data daily to make sure you know if planned capacity is in line with the actual output. Further on, we talked about 5S, one of the tools to standardize on what should be where (and what should be out! ), because we really needed the space. Luckily there was one lady, Jodi, who had heard about 5S before during a Quality Training. She was happy to find out she could really (try to) apply it now. We generated a fixed agenda for their daily production meeting and elaborated on safety stocks, bottlenecks, wastage and looked for the right spot to put up an extra packaging line. All in all; it were very intensive 2 days! Everybody promised to cooperate in the actions, and follow up is now important. In Cadapa we worked on Standard Operating Procedures for the Organic Cotton Program, called RESET, of Women on Wings’ partner GVK. A very promising program, with great goals on women empowerment and ecological impact. Because of the planned upscaling, we defined quite a few processes together with the team and got very much into the details of the what, who, where, when and how. It helped them a lot to structure their minds and all should be put (and maintained!) now into some kind of manual for new colleagues. Since many things were still under discussion, the team has to work hard to get everything ready on time. At least they have the guidelines now and they should be able to work on SOP’s on their own. It was a great week; I loved doing this, it gave me a lot of insights! There is a lot to discuss, to follow up and probably to re-discuss, but I do hope the workshops added value to these social enterprises in order to grow the number of jobs for women!